This photo was taken inside a grand Catholic Church showing the whole scene as the ceremony is under way. I quickly snuck up to the choir balcony to take photos while the liturgy was happening, as I knew I had the time to take some photos that showed the beauty of the church. It's important for your wedding photography that you choose a photographer that has experience inside a variety of churches and has dealt with the many house rules that limit photography. I have photographed many church weddings with different religions, and my adaptability allows me to think on my feet in case the lighting or positioning of the subject changes unexpectedly. Sometimes the First Kiss happens before the rings are exchanged, for example. I am also stealthy and can sneak around to see get different angles without distracting guests or drawing the ire from the priest, and my camera is very quiet, which is also an important feature during a more solemn formal ceremony. Catholic ceremonies include the Introductory Rites, Liturgy, Rite of Marriage, Exchange of Rings, Mass or no Mass (which changes the ceremony length considerably), and the Offertory. 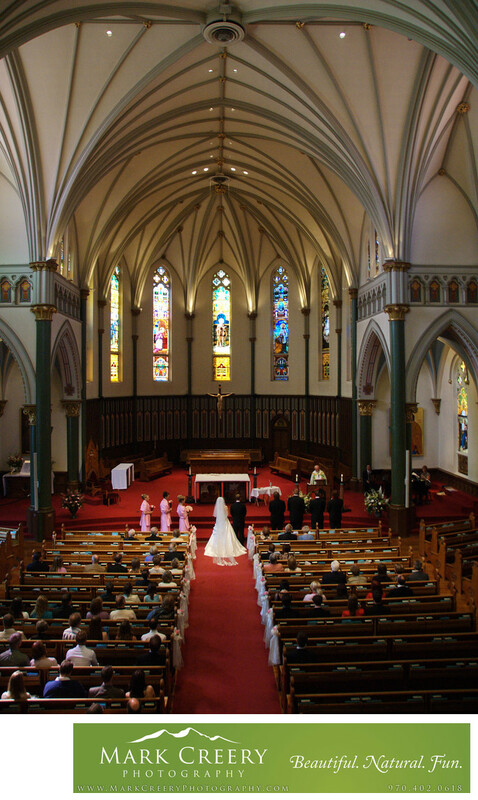 Denver has a wide range of churches that all have their different challenges for wedding photography.